When I invested into KAS Bank, the Dutch, the main motivation was the cheap valuation and the stable core business (custody). One add-on was that they wanted to extend their retail business together with dwp bank from Germany. As a compensation for the loss of the anticipated annual saving that KAS BANK would have realised from 2016 onwards, dwp bank will pay KAS BANK a lump sum at the end of June which, after deducting the costs in 2014, amounts to approximately € 20 million. KAS BANK will use this one-off compensation to invest in further improving its efficiency and its services to institutional investors. dwp bank will focus its future investments on improving the quality and standards of its operations and IT. 20 mn compensation for a 160 mn Market company is a lot, but it seems that this contract would have been quite good for KAS Bank going forward. Maybe it was so good that dwp bank only recognized it after signing ? I don’t know. In any case, I think the “Value case” for KAS Bank is still intact. Book value should still be achievable, which would mean the stock has still 50% upside let, despite the quite satisfactory performance of +58% (incl. dividends) since I bought the stock 2 years ago. A few weeks ago, I finally sold the rest of my April SA position. I never really explained this in more detail. When I first looked at April SA, I didn’t buy it because the stock was not cheap enough (part 1, part 2, follow up, follow up). Nevertheless, the new-found enthusiasm for European and especially French stocks led to a significant multiple expansion from around 8xP/E to ~ 14xP/E in June. Although I still think that April is not a bad company, I had to admit that the ~63% return I made on the stock was much more luck than anything else as I don’t think that multiple expansion like this (even considering shrinking EPS) could be forecasted. Additionally, I found much more interesting alternatives in the insurance sector (Admiral, NN Group), so I decided to sell although the two years holding period were shorter than I would normally target. A few days ago, Draeger revised their guidance for 2014 significantly downwards. The stock got hammered significantly, the Genußscheine lost some value as well but less than the shares. 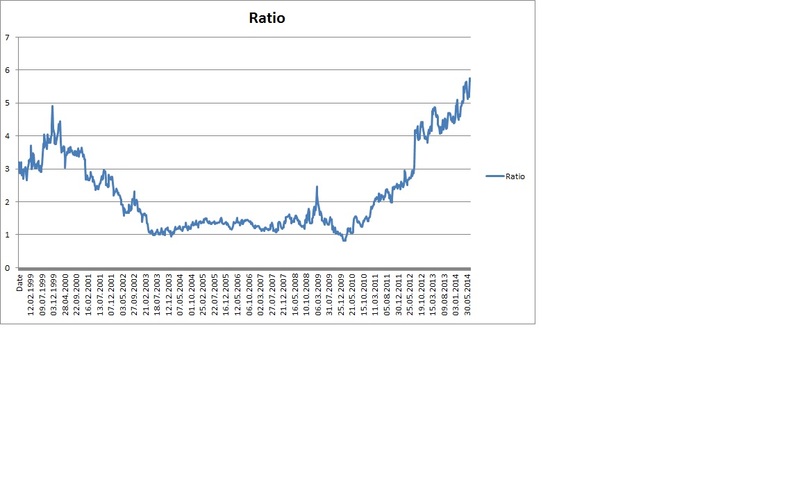 At almost 6 times the Pref shares, the relative risk/return ratio is not as good as it was before. With almost 7%, the Draeger Genußschein is still with a margin my largest position. In order to reflect the somehow lower relative potential of this position, I will cut the position to a 5% stake going forward. No real news but a very interesting developement at my largest portfolio position, Draeger Genußscheine. As a refresher: The “Genußscheine” include the right to receive 10 times the dividend of the pref shares (DRW3, ISIN DE0005550636). I started the position as a long Genußschein / Short pref shares “carry trade”. I decided to cover the short when Drager issued a EUR 210 offer and keep the Genußscheine as this put a floor under the price. Now, in the last view days one can see something interesting happening: The Pref shares trade lower while the Genußscheine jumped. 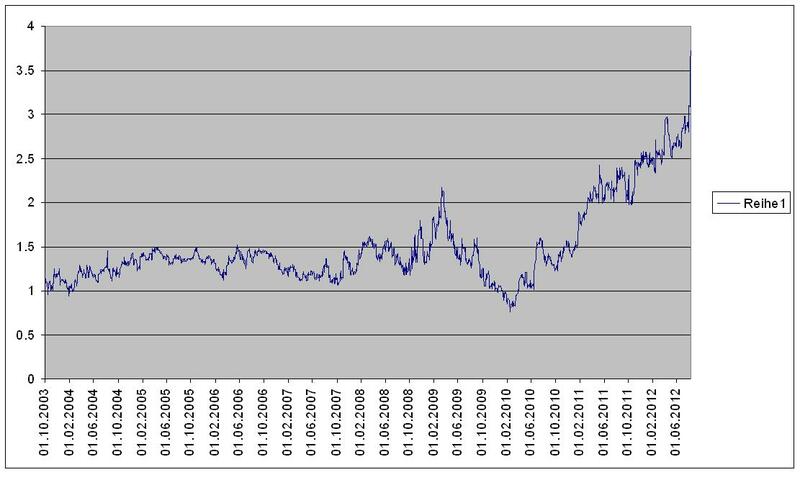 If we look at the 10 year history of price of the Genußscheine divided by price of the prefs , we can see that the relation has increased significantly to a 10 year high at currently around 3.7 times. I didn’t find any real news, however in some internet boards there is a speculation that either Draeger might increase the dividend or even come out with a higher offer. I am not sure about that if they will really do something. For the patient investor, I think the Genußscheine will be still an intersting medium term investment. For the portfolio I will hold them unless I find something better, there is no need to sell. I think this is the same lesson as from the AIRE KGaA example as well as with the Bertelsmann Genußschein: If someone really wants to have a company or a certain share class / security , it usually pays off to wait and not jump on the first offer. In the past, I often used to sell at the first offer, being happy to make a nice gain quickly. But as those two example show (so far), the risk /return relationship of just doing nothing and wait further seems to be quite good. The only “problem” now is that the position is currently 10.2% of the portfolio. a ~10% is kind of the maximum I can stand for a single position, I will have to decide to sell if the Genußschein moves further. 5. However, Draeger could afford to raise the dividend quite fast back to or above last years levels as it doesn’t hurt shareholders anymore (positive). Now we are somewhere in between. The percentage is high enough so that Draeger does not need to do really nasty stuff, although the percentage is too low to see higher dividends on very short notice. Draeger will also be motivated to buy anything which comes on the market under 210 EUR, so going forward there is a nice “put” under the current market price. Siemens had already seen the value in the convert market last month and looked to take advantage once again by attaching the warrants into pref shares, which were turned into a tradable warrant by Deutsche Bank, to a bond. Rather than take the normal approach of a Deutsche Bank SPV bond, some Bunds of a near tenor (2.5% February 2015s) were sourced and bundled – to create a German state exchangeable into Draegerwerk, without either party being involved. The bonds of €79.6m principal trade at 106% of par and the March 2015 bonds were issued with a 2.5% coupon and packaged with the warrants for a total 134.631% of par to raise €107.17m. A placing in the illiquid prefs helped with the delta hedge for hedge funds that dominated the book of about 40 lines. As the warrants have an exercise price of €63.68, versus the €78.40 placing price, this was a true technical trade, but a few outrights were interested and were filled in full. So basically Siemens did cash out the Warrants from Draeger which they got when they sold their JV stake to Draeger. They used this structure so that hedge funds could invest in this instrument and extract the option premium. Following yesterday’s post about the 210 EUR offer per “Genußschein”, some other interesting aspects should be considered. Many Draeger shareholders were maybe well aware of the effective massive dilution through the Genußscheine. The repurchase offer with 210 EUR is considered to be very advantagous for shareholders and therefore the net effect of the Announcement (Dividend reduction against cheap repurchase price) is a positive for shareholders. As the announcement alone maybe caused this jump, a high acceptence ratio could possibly move the stock price even higher. So there is a lot of “upside risk” in the stock from a short perspective. Another reason for the jump in the share price could of cours be some short covering, if I was not the only one who has the relative value trade in place. So we can see, there are many paths how this could develop. I think what is also interesting in this case is the fact that as Genußscheinholder the interests are not aligned with Management (and shareholders) but directly opposed. This is something one should keep in mind. In a classic “carrot and stick” approach, Draeger issued a buyback offer today for the Genußscheine at EUR 210. The German announcement is quite funny, they argue to finance the repurchase with a one time dividend cut by ~-90%. This one time cut wouldn’t even finance 5% of the to be repurchased Genußscheine, so the only reason to do this is to scare some Genußschein holders to sell if the yield drops to less then one percent. As an additional effect the 2011 result of Draeger shows a positive effect as they have already accrued a higher amount of interest for the Genußscheine. Going forward, they announce additionally to reduce the dividend from the current 30% of net income to 15% of net income until they meet their target equity ratio of 40%. If history is any guide, as a Genußschein holder you most likely should just lean back relax and get some popcorn. Bertelsmann in 2010 was in a similar situation and tried to buy back their Genußscheine at 180, from that the price went straight to 225. Inmy opinion the Draeger offerproves the following: They actually proved that the Genußscheine are a problem for the shareholders andthey need to get read of them. Effectively they introduced a “put option” at EUR 210 for the Genußscheinholder. There might be less liquidity in the future,but with the preference shares at 70 EUR plus,the 210 EUR are still a joke. For the long Genußschein short Vorzug strategy in the portfolio I will reduce the short position at least by half,as the implicit put at 210 EUR reduces the downside significantly. Draeger Genußschein – die billigste Medizintechnik Aktie der Welt !!!! Mal schauen ob die reisserische Schlagzeile den Kurs hochbringt, aber Spass bei Seite. Draeger hatte ja wie gestern berichtet eine Anpassung der geplanten EBIT MArge nach oben gemeldet, die genaue Meldung findet sich hier. Die Drägerwerk AG & Co. KGaA erwartet für das Geschäftsjahr 2011 ein besseres Ergebnis als bisher prognostiziert. Das Unternehmen rechnet nun – unter der unveränderten Annahme eines leichten Umsatzwachstums – mit einer EBIT-Marge von 8,0 bis 9,5 Prozent (bisher 7,5 bis 8,5 Prozent). Nachdem im letzten Jahr die EBIT Marge bei 8,9% lag und der Umsatz fast stabil ist würde ich das mal so übersetzen: Der EBIT bei Dräger wird vmtl. auf Vorjahreshöhe oder leicht darüber liegen. EPS waren im letzten Jahr 6,19 EUR. Auf diesen “Schock” hin haben einige Analysten Ihre EPS Ziele gleich mal nach oben gesetzt, so z.B. WestLB von 5.39 EUR auf 6,33 EUR und die Commerzbank gleich von 4.69 EUR auf ebenfalls 6,33 EUR. Das erklärt natürlich auch den mehr als 10% Sprung der Aktie. Auf Basis dieser Zahlen sieht die Aktie mit einem P/E von 14,5 nicht teuer aus. Wir hatten ja in einem früheren Posting schon mal darauf hin gewiesen, dass man ökonomisch eigentlich “fully diluted” rechnen sollte. Damit ergeben sich als “Diluted Earnings” ungefähr (6.33x(10.16+6.35)+10)/(10.16+6.35+11.41)= 3,74 EUR pro Aktie für 2011. Dann wären die Vorzüge mit einem KGV von 23.5 recht sportlich bewertet. Theoretisch kann man das natürlich auch aus Sicht des Genußscheins rechnen: für knapp 180 EUR bekomme ich 10×3.74 oder 37,4 EUR Gewinnanteil. Das macht ein KGV für den Genußschein von schlappen 4,8 !!! Fazit: Damit dürfte die Überschrift wieder stimmen, der Genusßschein ist mit einem KGV von 4.8 wohl tatsächlich eine der billigsten (profitablen) Medizintechnikaktien der Welt. Heisst halt blöderweise “Genußschein”.